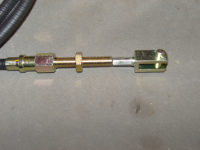 Handbrake cable for knock over handbrake applications. Cable has a clevis as opposed to an eye at the handbrake end. For later type THWAITES 4000, 6000 and 7000 models with lift up bonnet. Please check with us that this is the correct one for your machine.